The Nopal cactus, also known as “prickly pear,” is an edible cactus plant native to the mountains of Mexico. It has been used since ancient times as both a food and as a medicine for its health benefits. This vegetable-type edible cactus is popular in Mexico and other Central American countries, parts of Europe, the Middle East, India, North Africa and Australia. 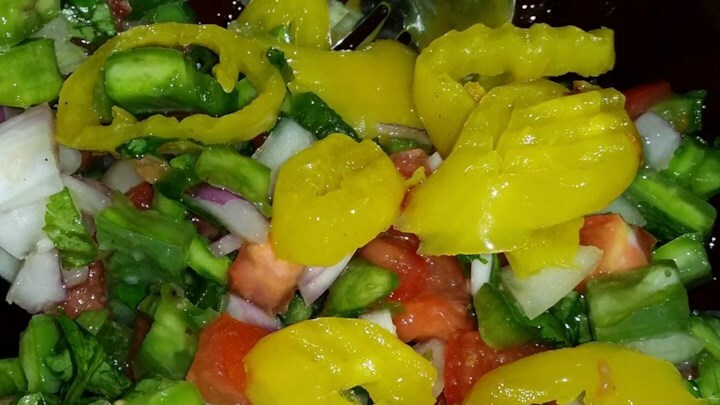 The prickly pear plant has two different edible sections: the pad of the cactus (nopal), which can be treated like a vegetable and the pear (tuna), which can be treated like a fruit. The nopal cactus grows wild throughout the American southwest down to South America and up to Canada. With a soft but crunchy texture that also becomes a bit sticky (not unlike okra) when cooked, the nopal cactus tastes similar to a slightly tart green bean, asparagus, or green pepper. Studies have shown that the pectin contained in the nopal cactus lowers levels of “Bad” cholesterol while leaving “Good” cholesterol levels unchanged. Other study found that the fibrous pectin in the nopal cactus may lower diabetics need for insulin. Both fruits and pads of the nopal cactus are rich in slowly absorbedsoluble fibers that help keep blood sugar stable. Fiber means Control. This means that you will have less cravings and feel fuller since Nopal is extremely high in fiber. Nopal also has a high vegetable protein that lessens cellulites and water retention in your body. Nopales, also known as cactus juice or prickly pears, is of the species Opuntia ficus-indica. It is a popular vegetable in Mexican dishes due to its low calories and succulent, green leaves. The ability of Nopales to fight inflammation in the muscles, arteries, gastrointestinal tract and cardiovascular system is a well known fact. It has also been shown to lower pain in people with urethra and bladder, bladder infections as well as gallstones. The photochemical in Nopales are useful in making the immune system stronger. Nopales are rich in antioxidants known as betalins. The high amounts of soluble fiber in Nopales have been found through research to combat high levels of cholesterol. Nopales are particularly useful to people suffering from non-insulin diabetes. It has been found to lower and balance blood pressure. The functions of the digestion process such as absorbing excess water as well as speeding up bowel movement are enhanced by the insoluble fiber in them. Nopales are endowed with a variety of minerals and vitamins such as vitamin A, C, K, B6, riboflavin among a host of other minerals such as calcium. With high content of amino acid, vitamin and minerals, nopales is considered a low calorie food hence beneficial for weigh loss. They contain 17 amino acids, with 8 of them being essential. The stems and fruits of Nopales contain quercetin 3-methyl, flavonoid which is said to a powerful neuroprotector. Cactus juice, also known as nopales, nopalitos or prickly pear juice, is a popular beverage in Mexico, South America, India, the Middle East and parts of Europe. This beverage has recently caught on in popularity in the United States. The fleshy oval leaves of the cactus plant have a sticky liquid that is similar to asparagus, green beans or green peppers. The nectar of this plant is composed of water, sugar and minerals. Cactus juice provides you with beta-carotene, vitamin B, vitamin C, iron, magnesium, calcium and numerous other minerals and vitamins. Additionally, this fruit is rich in amino acids, specifically taurine. Taurine has antioxidants and flavonoids, both of which are beneficial to the body. Cactus juice has shown to help to prevent inflammation in the muscles, arteries, gastrointestinal tract and cardiovascular region. Cactus juice has a laxative effect and has shown to effectively treat constipation. In addition to easing constipation, cactus juice can reduce inflammation in the urethra and bladder. Cactus juice is a good source of photochemicals, which can help strengthen the body's immune system. Additionally, the nopal cactus has high levels of betalins, which are antioxidants. The American Heart Association has conducted research examining the benefits of cactus juice in reducing cholesterol levels. Enjoy 1 to 2 tbsp of cactus juice up to three times a day to benefit from the numerous benefits provided by this fruit. Nopales are spectacularly healthy type of cacti with a wide range of health benefits including its ability to aid in weight loss, prevent cancer, improve skin health, protect heart health, regulate and improve digestion, boost the immune system, optimize metabolic activity, build strong bones, cure insomnia, and reduce inflammation throughout the body. The wealth of health benefits that come from nopales are mainly attributable to its nutrition and vitamin content, which includes riboflavin, vitamin B6, copper, iron, fiber, vitamin-A, C, K, calcium, potassium, magnesium, and manganese. It is also an important source of certain organic compounds like phytochemicals and certain polysaccharides that also contribute to the health boosting power of nopales. Digestion: Nopales are forms of cacti, so they are very fibrous and contain a great deal of dietary fiber. Dietary fiber is essential in the digestive process, because it adds bulk to bowel movements that make them easier to pass through the smooth muscles of the digestive tract. Weight Loss: There are a number of components within nopales which can aid in weight loss. First, fiber can make the body feel full and inhibit the release of ghrelin, which is the hunger hormone, so overeating is reduced. Secondly, this plant is very low in saturated fat and cholesterol, but it is packed with metabolic potential, so the body works at a higher level without gaining weight. Cancer Prevention: The variety of phytochemicals, flavonoid compounds, vitamin-C, and other antioxidants found in nopales make it extremely beneficial for the entire immune system, particularly when it comes to various cancers. Metabolic Activity: One of the most important aspects of nopales in terms of health is its mineral and vitamin content. Nopales contain thiamin, riboflavin, niacin, and vitamin-B6, all of which are vital components of cellular metabolism and normal, regulated enzyme function throughout the body. Builds Strong Bones: The mineral content of this powerful cactus leaf includes a modest level of calcium, which is an essential part of building strong bones and repairing bones after being damaged. Improve Sleep: This plant also contains magnesium,which is a useful mineral for inducing feelings of sleep for people suffering from insomnia, chronic anxiety or restlessness. It induces the release of serotonin in the body, which results in increased melatonin levels. Inflammation: The juice that is taken out of the pickle pear leaves of nopales has been shown to have anti-inflammatory effects on a variety of body parts, including those symptoms associated with arthritis, injury, joint pain, and muscle strain. Skin Health: The phytochemical and antioxidant characteristics of nopales make them a good defensive mechanism against premature aging symptoms, like wrinkles and age spots. Diabetes: The extracts from the leaves of prickly pear cactus can be powerful regulators of glucose levels within the body. For patients with type 2 diabetes, it can cause a reduced spike in glucose levels following eating, which makes the management of diabetes easier. Nopal cactus grows all over the world and it’s used as a great food in Mexico, South America, and many other areas of the world. And it has amazing health benefits such as: Its a powerful anti-inflammatory, a very good antioxidant, helps with weight loss, lowers cholesterol, has plant sterols to dissolves arterial plaques, lowers blood sugar, detoxes the liver, good immune booster, helps with gastric ulcers, lots of fiber, promotes the grow of probiotic bacteria, helps with hangovers, lowers blood sugar, lowers blood pressure and more. Nopal cactus crece en todo el mundo y es usado como una gran comida en México, América del Sur, y en muchas otras zonas del mundo. Y tiene increíbles beneficios para la salud tales como: es un potente antiinflamatorio, un muy buen antioxidante, ayuda con la pérdida de peso, reduce el colesterol, esteroles vegetales que disuelve las placas arteriales, baja el nivel de azúcar en la sangre, el hígado detoxes, buen refuerzo inmunológico, ayuda con las úlceras gástricas, mucha fibra, promueve el crecimiento de las bacterias probióticas, ayuda con la resaca, baja el nivel de azúcar en la sangre, disminuye la presión arterial y mucho más. For this Cinco de Mayo, we’re skipping the carne asada and enchiladas and swapping them for a more traditional ingredient: cactus. The nopal cactus, also known as “prickly pear,” is a plant native to the mountains of Mexico. It has been used as both a food and for its medicinal benefits by the native peoples of that region since ancient times. It has been widely valued for its nutrition and vitamin content, which includes riboflavin, vitamin B6, copper, iron, fiber, vitamin-A, C, K, calcium, potassium, magnesium, and manganese. It’s high content of dietary fiber makes it widely used to aid in digestion. If your grocery store or farmers market doesn’t sell cactus, you can find it at most Latin grocery stores in the produce aisle, either whole or already prepped and chopped. (My local Whole Foods is selling bags of already chopped cactus for Cino de Mayo). This homesick Texan decided to transform the traditional US Family Gathering meal of Green Bean Casserole by substituting the green beans with slices of cactus. "Have you ever eaten cactus? Edible cactus, which in Spanish is known as nopal, comes from the prickly pear cactus, a beautiful plant that dots the landscape of West Texas. The plant has wide paddles that resemble a beaver’s tail and with a little care (yes, you remove the thorns) the paddles make for a delicious vegetable. It’s also extremely nutritious, as some studies have noted that eating cactus helps treat diabetes and lower cholesterol levels. Though health benefits aside, I simply like to eat it because it tastes so darn good. When people ask, “What does cactus taste like,” the best answer is that it’s similar to green beans. And so with this in mind, I decided to make a cactus casserole to replace the green-bean casserole we won’t be eating this year." 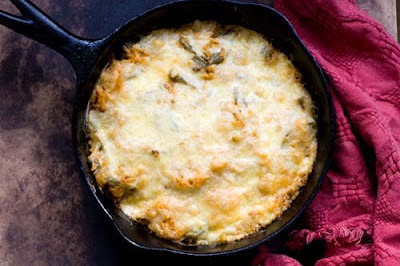 Read the whole 'CACTUS CASSEROLE RECIPE'. Art has been referred to as “food for the soul” but later this year one of America’s most influential living artists is to go one better and bring art for the stomach to London. 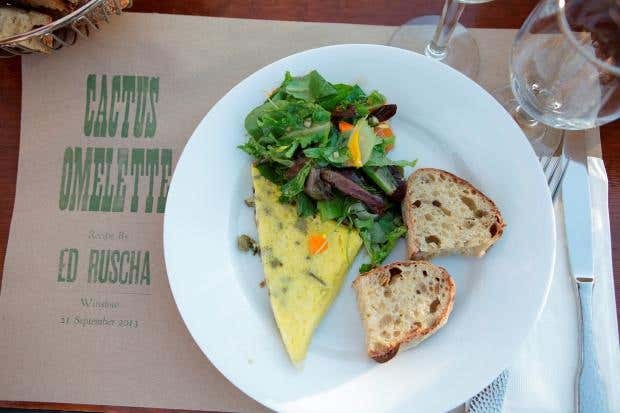 Ed Ruscha, one of the leading lights of pop art, is to contribute to a 30-day festival held at the Barbican with his own brand of food art: omelette with cactus, which will be served to hungry visitors. People who practice a healthy, natural lifestyle often promote prickly pear cactus as a superfood. They cite the antiviral, anti-inflammatory and anti-clotting properties of the plant. In Mexican folk medicine, the cactus pulp and juice are used to treat skin wounds, stomach swelling, digestive problems and urinary tract infections. According to the Mayo Foundation for Medical Education and Research, preliminary studies indicate that prickly pear extract may decrease blood glucose levels in patients with type 2 diabetes. The fiber and pectin found within the cactus appears to lower blood sugar by decreasing sugar absorption in the stomach and intestines. The plant extract improves insulin sensitivity, and it also protects the liver from oxidation. While doctors of traditional medicine hesitate to call prickly pear cactus a superfood, they believe that it can supplement a healthy diet. The high-fiber cactus is rich in antioxidants and carotenoids. Practically the entire plant is edible and nutritious, from the flowers and fruits to the stems and leaves. "The International Journal of Food Science and Nutrition" reports that prickly pear cactus is a good source of several important minerals. Calcium, potassium, magnesium and phosphorus are among them. The prickly pear seed contains linoleic acid, an essential fatty acid with numerous health benefits.